Lefkada (Lefkas) is a very special Greek island, which is connected with Mainland Greece with two bridges. The island has beautiful beaches, impressive sites and hospitable inhabitants. It is characterised by mountainous terrain and green countryside, making it unlike many other Greek Islands. Lefkada is known by many names, including Lefcas, Levkas, Leukas, and Lefkas, Greece, depending on where you come from. Lefkada (Lefkas) Island is a part of the Ionian Island cluster and is located in the Ionian Sea. It is situated above the islands of Ithaca and Kefalonia, west of the coastline of the Etoloakarnania Prefecture. Its coastline is 117 km and it has approximately 21,100 inhabitants. 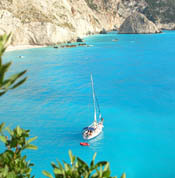 Lefkada Island is a cultural center of the Ionian cluster, with many historical sites, monuments and traditional houses. Apart from the capital of Lefkada, the island possesses numerous traditional villages, such as the cosmopolitan coastal resort of Agios Nikitas, the mountainous and traditional villages of Spanochori, Athani and Vafkeri, the scenic and verdant settlement of Vassiliki, the popular and modern town of Nydri, the seaside village of Sivota, as well as the settlements of Poros, Nikiana, Lygia, Karya, Vlyho and isles surrounding Lefkada. Take a trip to this magnificent island and spend a relaxing and fun-filled holiday in Lefkada, Greece. Lefkada Island offers an excellent variety of hotels, allowing visitors to select the Lefkada hotel that best suits their budget and needs. Accommodation in Lefkada ranges from luxury to budget hotels. If you are looking for high-class accommodation, you may prefer Lefkada luxury villas for rent or luxury Lefkada hotels. Families and groups of friends can choose from a wide array of studios and apartments in Lefkada. Larger groups may decide that a Lefkada holiday villa is their best bet. Lefkada rooms for rent and cosy studios are ideal for couples that have planned a romantic holiday on the island. We provide hotel accommodation in Lefkada (Lefkas), Greece, such as Lefkada hotels, studios, rooms to rent, luxury villas, and apartments in the seaside resort of Vassiliki, one of the most picturesque settlements on the island. For more information, see their websites above. The stunning coastline of Lefkada Island offers tourists an abundance of beautiful pebbly and sandy beaches, and cool, turquoise waters. Some of the beaches in Lefkada are considered the best in Greece. On the eastern side of Lefkada, the beaches are sheltered by the mainland, while the western coast is open to the Ionian Sea. In Lefkada you will find a number of popular beaches, where visitors spend hours lying in the sun and bathing in the sea. 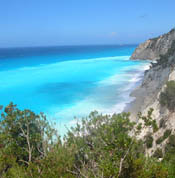 Many Lefkada beaches are organized and offer chaise longues, umbrellas, and water sports facilities. You will always find at least one café nearby, where you can get refreshments and snacks. The most popular Lefkada beach is by far Porto Katsiki. It is located on the south-western side of Lefkada and is celebrated for its azure waters and steep cliffs. Porto Katsiki Beach is frequently declared the best beach in Greece. Visitors also prefer the long, sandy beaches of Kathisma and Pefkoulia on the western coast and the cosmopolitan beach of Nidri on the eastern coast. Vassiliki Beach is ideal for windsurfing and is equipped with several water sports booths and schools. Nikiana Beach is preferred by fishing enthusiasts. We recommend visiting Agios Ioannis Beach, which is situated near Lefkada Town and is a very long stretch of sand with azure waters and water sports, kite surfing and wind surfing facilities. Egremni is one of the finest beaches in Lefkada, located beneath high cliffs on the western side of the island. It is a long beach with coarse sand, clear waters and is quieter than other Lefkada beaches because it is a bit difficult to get to. You must take the asphalt road up to the descending dirt road and then go down about 200 steps to reach Egremni Beach. Despite its being difficult to get there, it is well worth the effort. In the village of Sivota, you can relax on the small, peaceful single beach, which is located next to the charming port, where yachts are moored. The majority of nightlife venues in Lefkada (Lefkas) are situated in Lefkada Town, Nidri and Vassiliki. Visitors who are looking for exciting nightlife in Lefkada won't be disappointed, as there is a good selection of clubs, bars and cafés, as well as an endless array of traditional tavernas and posh restaurants. Lefkada holidays aren't complete without trying the island's traditional cuisine. Some of the popular dishes include "bourgeto" (fish in a tomato-onion sauce), "savoro" (fish in a marinade of oil, vinegar, rosemary and raisins), cabbage pie, squash pie, sausages and a variety of fresh grilled fish. After a delicious meal, we recommend a glass of "soumada", which is the local drink made from bitter almond. Many festivals and events are held in Lefkada, providing visitors with the opportunity to experience the traditions and customs of the island. In Lefkada Town, a celebration takes place during Mardi Gras. In August the "Festival of Literature and Art" is held, with dance performances, art exhibitions, scientific symposiums, theatrical performances and concerts. August is also the time when the International Folklore Festival takes place, with the participation of musicians from all over the world. In Vassiliki, you can attend the Festival of the Virgin Mary on August 15, while in July and August in Nidri the "Alexandros" Cultural Association organizes the "Valaoritia" cultural events. Lastly, in Karya on August 11 you can see the Re-enactment of a traditional Lefkada wedding. While on vacation in Lefkada Greece, you have the opportunity to visit some wonderful historical and natural sights that make the island unique. First off, purchase a map of Lefkada which indicates the island's sites. Begin your tour of Lefkada with a visit to the capital town, where you can take a stroll through the charming streets to admire the lovely architecture, and see the Agia Mavra Venetian Castle, the Churches of Agios Spyridonas and Christos Pantokratoras and the Archaeological and Phonograph Museums. In the tourist resort of Nidri, a visit to the ruins of the pre-historic settlement, the Dimosari gorge leading to a waterfall, and the Skaros Woods is a must. In Vafkeri you can see the Monasteries of Asomaton and Evangelistria, while in Karya there is a superb Folklore Museum. The traditional village of Eglouvi is host to the "Volti" stone huts, while in Syvros you can visit the beautiful site of the Kerasia Springs. Remember to take a boat tour of the islands located opposite Nidri, including Scorpios - the island of Aristotle Onassis -, Meganissi, Sparti, and Scorpidi. Lefkada, Greece has a typical Mediterranean climate, with warm and sunny summers and mild winters. From November to March, Lefkada weather is humid and rainy, and temperatures range on average from 13°C - 20°C. Temperatures rise in spring, ranging from 19°C to 24°C. Summer months as well as September are quite warm with temperatures sometimes exceeding 30°C. October in Lefkada (Lefkas) is still warm and enjoyable, as temperatures range from the low to the mid 20s. Getting to Lefkada, Greece is fairly easy. If you are coming from abroad, you should check for flights to Aktio, Preveza Airport, with a stopover at Athens Airport. Also, there are charter flights to Lefkas from many European countries. From Aktio Airport you can either take a bus or rent a car to Lefkada. The Airport in Aktio is also connected to the airports in Corfu, Kefalonia, Zakynthos and Sitia Town in Crete, enabling convenient transportation from one island to the other. Try to book your airplane ticket well in advance to find lowest possible airfare to Lefkada and any other of the above destinations. There are frequent bus routes to Lefkada from Athens, Thessaloniki, Patras and other major Greek cities, while if you are either in Kefalonia, Ithaca or Corfu, you can catch a ferry boat to Lefkada, as there are frequent trips, especially in the summer. For further information about buses, ferries and flights to Lefkada, Greece, you can contact one of the many Lefkada travel agents and tour operators, which will help you organize your trip in the best way. For your transportations around the island we suggest that you contact one of the reliable Lefkada Car Rental Agencies to book the car of your choice. This way, you will be able to explore the treasures of this wonderful place and have an unforgettable vacation.